If you ask what’s Fresh From Oregon this week it seems like anytime you can get Kale. The Portland Farmers Winter Market is over flowing with all types of greens this time of year and the Kale is looking great. There are several types of Kale as you look around the market, Italian Kale, Red Russian Kale and Curly Kale just to name a few. I chose to use the Curly Kale in my soup. 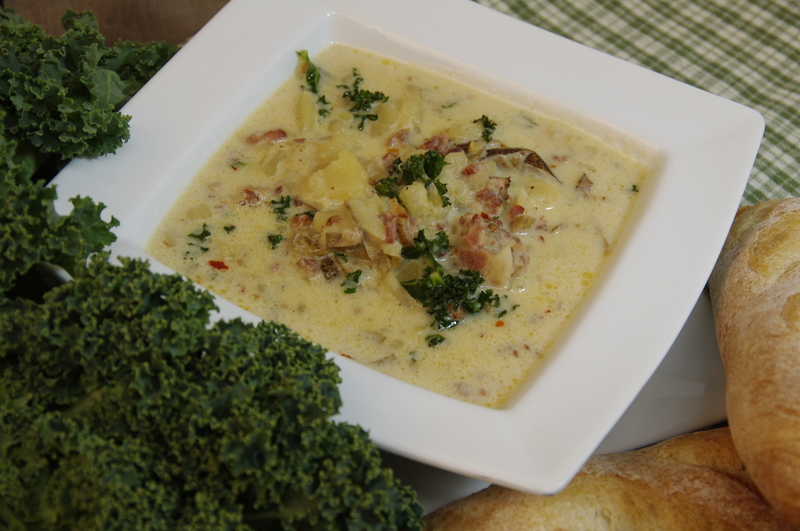 The recipe for Zuppa Toscana soup can be found all over the internet since this is a favorite soup sold at Olive Garden restaurants everyone wants to make it at home. I found one I liked the best on Mom On Time Out Blog and with a few changes created my version below. This is a very hearty soup and can be a meal in itself. This is no wimpy cracker soup, serve it with a great crusty bread and butter. 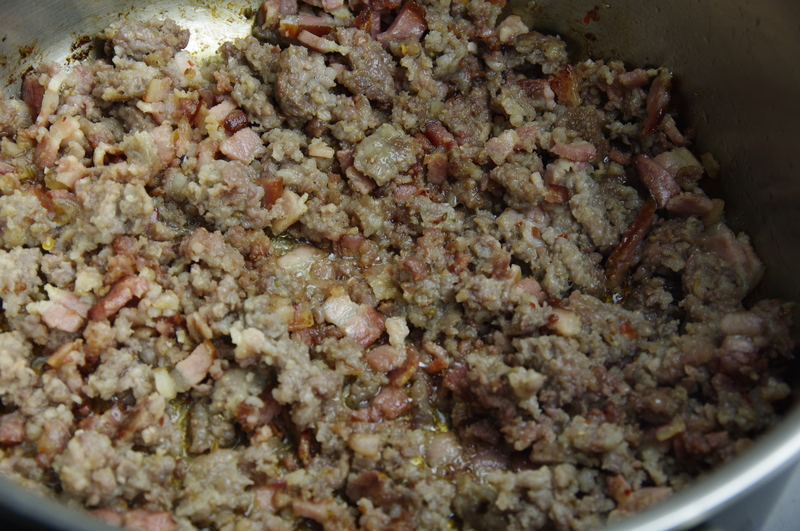 In large pot add the olive oil, sausage and bacon, cook over medium-high heat until the sausage and bacon are cooked and browned. Slice the potatoes about 1/4-inch thick, I use my mandolin to get an even cut, set aside. Once the sausage and bacon are cooked add the water and chicken broth to the pot. 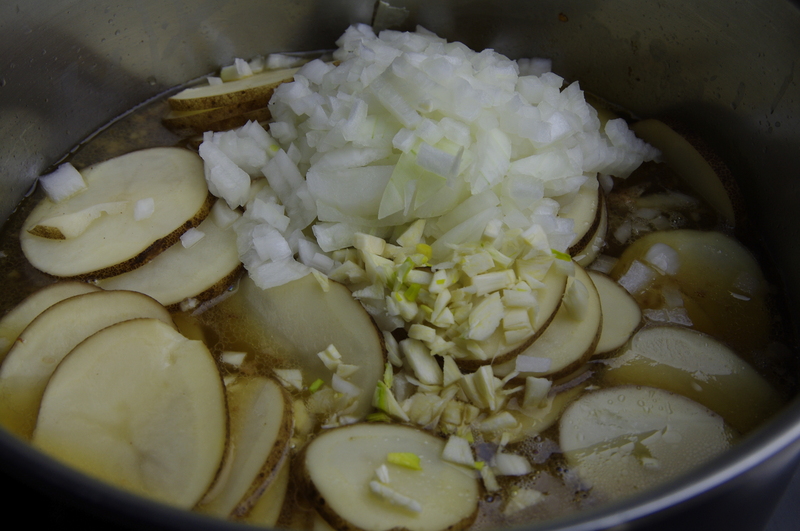 Add the potatoes, onions, and garlic. Cook over medium heat until the potatoes are cooked through about 30-40 minutes. 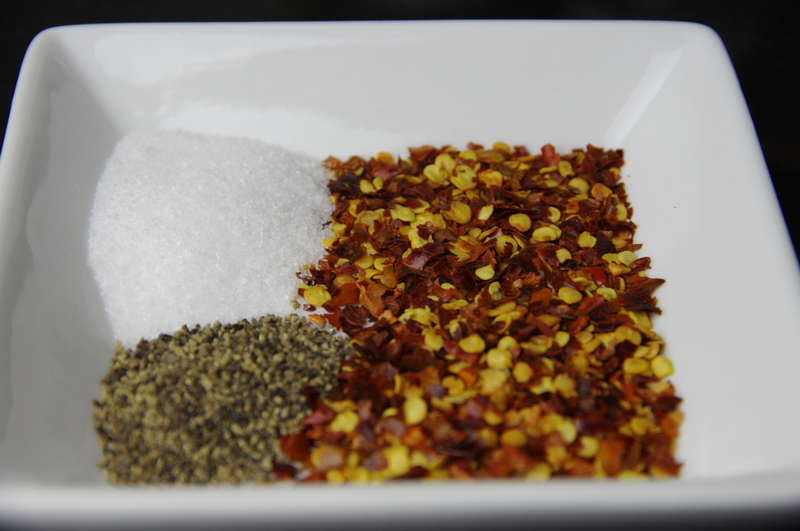 Add the red pepper flakes, salt and pepper and cook for another 10 minutes on low heat. 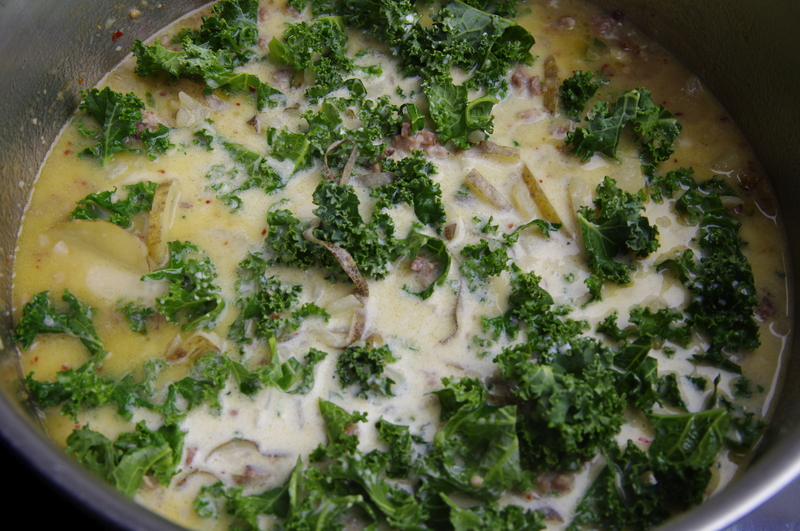 Add the kale and heavy cream and heat through about 5 minutes. Kale is a form of cabbage, but the central leaves do not form a head. It is more related to the wild cabbage than the ones that are grown in our gardens. 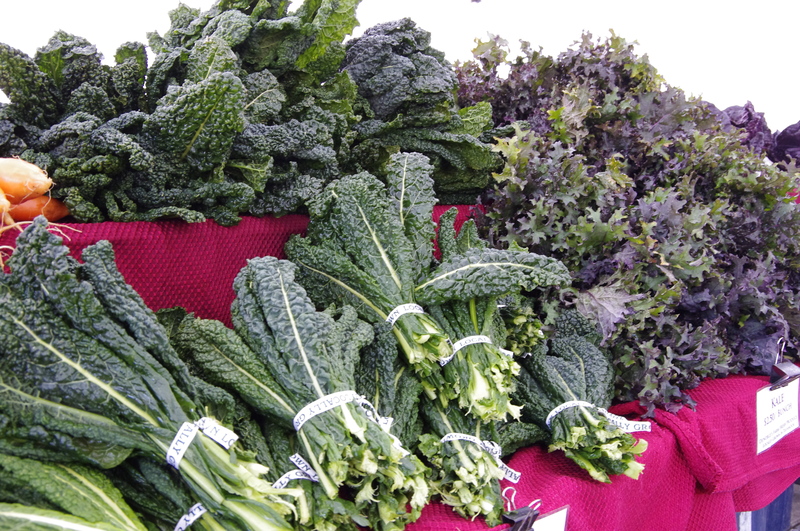 Kale is a cold weather crop and you will mainly find it in the spring, fall and winter. It freezes well and taste sweeter and has more flavor after is has been exposed to a frost. 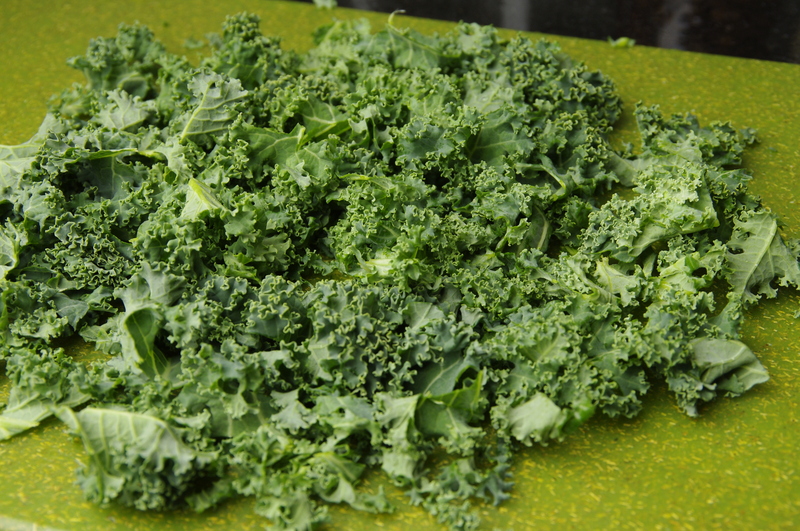 Kale can be used in soups, stews, salad, stir-fry’s and be dehydrated. 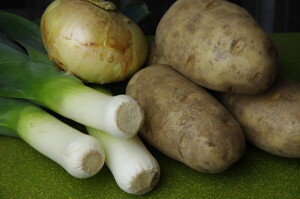 It can be steamed and used as a side dish and also is one of the ingredients in the traditional Irish dish colcannon. This past week on the mountain here in Oregon has been snowy and cold. The ski resorts here on Mt Hood received up to 5 feet of snow the past few days. 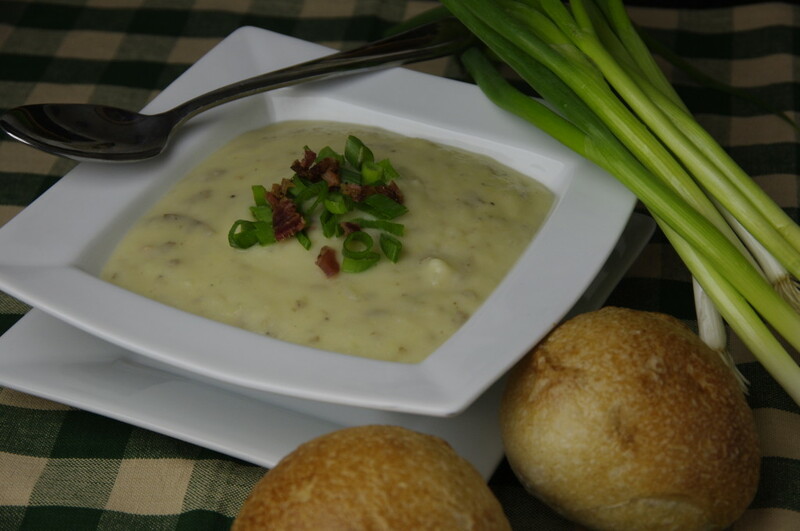 So what do we eat to keep warm, hearty potato leek soup. Leeks are Fresh From Oregon this time of year and I had three in my refrigerator from my last visit to the Portland Farmers Winter Market. This is a quick soup you can make in one hour. The secret ingredient that gives it extra flavor is bacon. This soup is so hearty that all you need to have with it to make a meal is a nice roll. 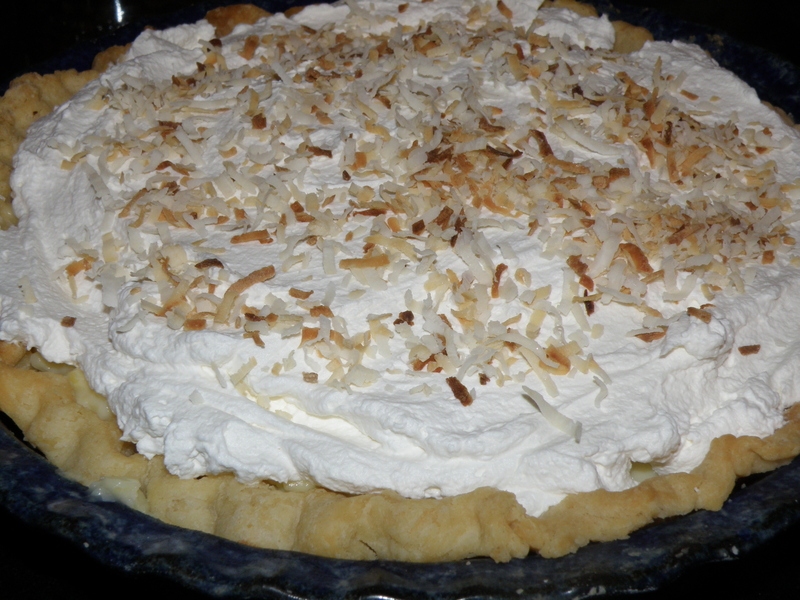 The recipe makes about 6 servings but you can easily double it. I had some extra so I just ladled the soup into a plastic container and placed it in the freezer for the next cold day we have here on the mountain. 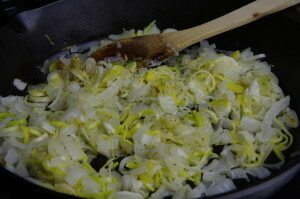 Melt butter in a saucepan over medium heat then add onions and leeks. Cook, stirring, until onions are limp and just slightly brown. 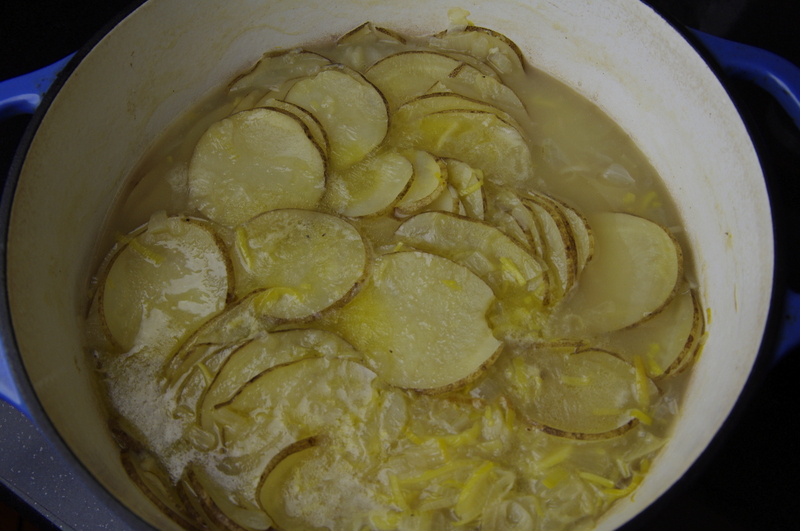 Add sliced potatoes to saucepan then pour chicken broth over the potatoes. 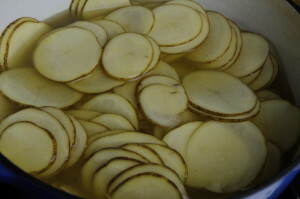 Continue cooking over medium heat until potatoes are tender, about 30 minutes. Using a potato masher or immersion blender mash potatoes until creamy. 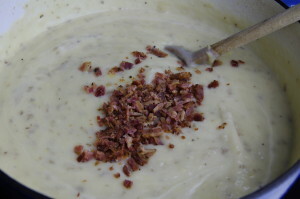 Add the heavy cream, salt, pepper and bacon, stir until mixed. Cook 15 minutes more over low heat. Stir frequently because the soup is thick, it will create bubbles and may splash and burn you. 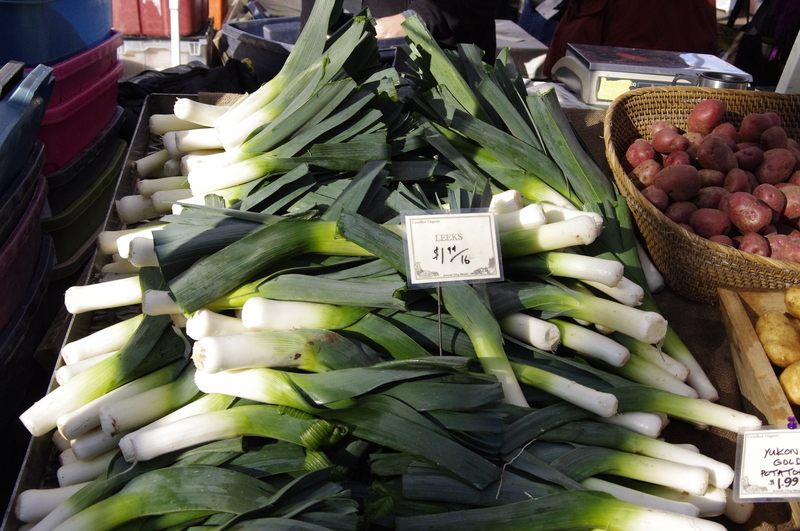 Leeks have a mild onion-like taste and can be eaten raw in salad, fried, broiled or used in soups. The white part and light green parts of the leek is what you want to use, discard the top dark green part. I have been thinking for days what my first blog should be and then it came to me. My grandmother and sister came over from Poland as young girls and their first job was making homemade pierogies. With the Easter holiday upon us I thought I would share our family recipe. These are perfect to make ahead of time and then freeze them. 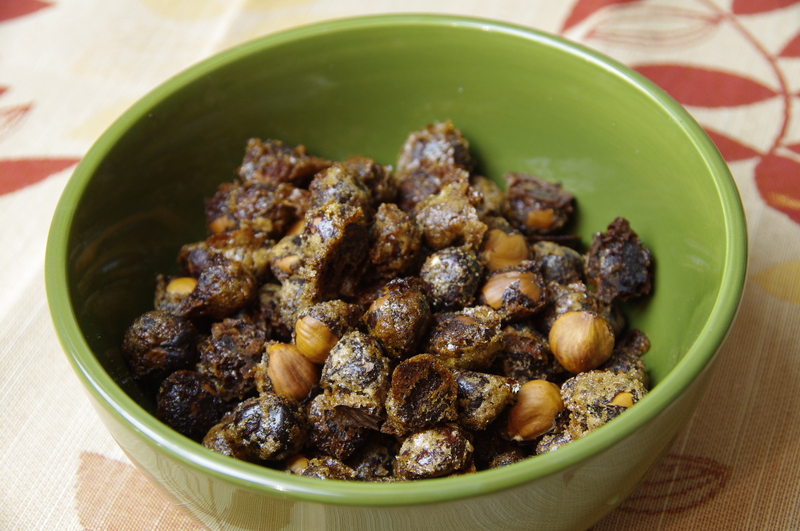 You can then take them out anytime and you have a perfect side dish or meal. Put the potatoes in a pot with the cold water and 1 tbsp salt. Place over high heat and bring to a boil. Cook until the potatoes are soft, for about 10 to 15 minutes after they start to boil. 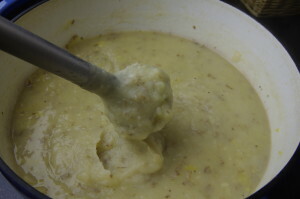 When the potatoes are nearly done, melt the butter in a saucepan and saute the onion over medium heat until soft (or longer, depending on your preference). Drain the potatoes and mash them. Add the cooked onion. Add the cheese, salt to taste and the pepper. Continue to mash until blended. Let cool. Combine the flour, egg, butter, ¾ cup water and the salt, preferable in a bowl, although you also can do it the old-fashioned way, which is right on a clean kitchen counter. Knead the dough on a flat, lightly floured surface for approximately 5 to 10 minutes, until it forms a smooth ball. Add water as needed if the dough seems chalky or hard, and add flour until the dough no longer sticks to the counter. Let the dough rest for at least a half-hour if you plan to cook the pierogies immediately, but, if possible, cover and let it rest in the refrigerator overnight to give the gluten in the dough more time to smooth out. Divide the dough. Roll out one piece about ¼-inch thick (or thicker, if desired) and cut into circles, about 2 inches in diameter for small pierogies, 3 ½ inches for large. Repeat with the remaining dough. Fill each circle with a heaping tbsp of potato filling (you can use a mini ice cream scooper for this), fold the dough over the filling and seal by pinching the edges well. Lay on floured surface and continue to make remaining pieroges. Cook the pierogies in a large amount of rapidly boiling water for about 5 minutes. Do not overcrowd them in the pot I cook about 12 at a time in a large pot. Place on wire rack so all sides dry you can then put in freezer container or cook some up! Makes 36 to 40 pierogies. For pan-frying, add some butter and sliced onions in a frying pan. Once then are just about brown add the pierogies and fry to a golden brown.